The Volkswagen Tiguan is all-new for 2018 with a bold exterior look, bigger-than-ever passenger cabin and available third row of seating for the first time. Whether you need five seats or seven in your next crossover, all of them will be more comfortable and even safer in the 2018 Volkswagen Tiguan than in competing crossovers like the 2018 Subaru Forester. And when you outfit your Tiguan with 4MOTION® all-wheel drive, it’ll even match the Forester for stability and traction on wet or icy roads. Get all the space and all the features your family needs from the 2018 Volkswagen Tiguan! Check out our online inventory of new Tiguan models and schedule a test drive when you find the one for you. Once you do, you’ll be glad you chose Carter Volkswagen. It’s worth the drive in from as far away as Puyallup. If you choose to add the available third row, that’s two more passengers you can safely fit in the 2018 VW Tiguan than you can in the 2018 Subaru Forester. If you don’t, you’ll find that you get more volume in the cargo area and more second-row legroom in the Tiguan than the Forester. The 2018 Volkswagen Tiguan is superior on the outside, too, with standard LED daytime running lights and LED combination tail lights. At the base level, the 2018 Volkswagen Tiguan and 2018 Subaru Forester make similar fuel efficiency and horsepower figures. However, the Tiguan gives you up to 221 lb-ft of torque — 47 more than the base Forester can give you. When equipped with 4MOTION® all-wheel drive, the 2018 Volkswagen Tiguan comes with four selectable driving modes, to tune the chassis for whatever road conditions may lie ahead. 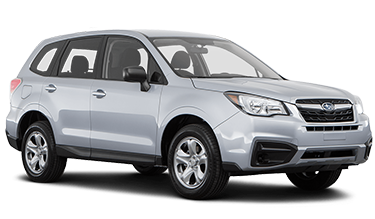 You get no control over the all-wheel drive system in the 2018 Subaru Forester. The 2018 Volkswagen Tiguan was a 2017 Top Safety Pick winner, as selected by the Insurance Institute for Highway Safety. That means it’s among the safest vehicles on the road today! The 2018 Subaru Forester won the 2018 version of that award — but, in IIHS testing, the Forester received a “Marginal” score in the passenger-side small overlap crash test, the second-worst score you can get. You can have peace of mind behind the wheel of the Tiguan, knowing it received the best possible marks on all IIHS crashworthiness tests. There’s even some unique safety features on the 2018 VW Tiguan: When equipped with Area View proximity cameras and Park Pilot parking sensors, the Tiguan can practically park itself. These handy features will help you navigate the Tiguan in and out of tight parking spaces safely. And you won’t find them on any 2018 Subaru Forester. Choosing between a vehicle that’s well-appointed for your needs and fun to drive isn’t a choice you have to make — with a new Volkswagen, you get both. You also get industry-leading safety features with Driver Assistance and extra security from the available Volkswagen Car-Net® App-Connect. At Carter Volkswagen in Ballard, we’re the Seattle metro area’s first choice for Volkswagen sales and service. We call it The Carter Advantage: We promise a free 90-day inspection of all vehicles sold, courtesy loan cars, free WiFi in our service center and so much more. Our commitment to the region goes even deeper — for every test drive we perform, Carter Volkswagen in Ballard will plant one tree in the Mountains to Sound Greenway. Located less than 20 miles from Renton and Redmond, we look forward to seeing you for your test drive soon at 5202 Leary Avenue Northwest, Seattle, WA 98107.